GIANT MYSTERY, SOLVED? Last year, when NASA's IBEX spacecraft discovered a giant ribbon at the edge of the solar system, researchers were mystified. They called it a "shocking result" and puzzled over its origin. Now the mystery may have been solved. Get the full story from Science@NASA. 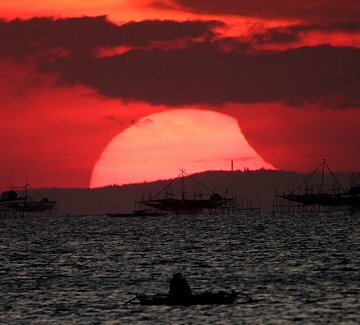 "The low-hanging sun was dim and I didn't need any special filter to photograph it using my Canon 350D," says Ty. "In the foreground, a young couple sat together in a boat enjoying the romantic view." 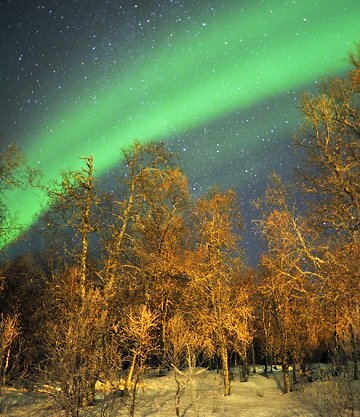 "The auroras were beautiful [last night]," says Fedrik Broms, who took the picture using his Nikon D3. "They were not in the mood for dancing, but they were intense. At times, the strong green light made the ice glow green too." The display could intensify even more on Jan. 18th and 19th. That's when a solar wind stream flowing from a coronal hole is expected to reach Earth. High-latitude sky watchers should be alert for Northern Lights. On January 16, 2010 there were 1092 potentially hazardous asteroids.